Corneal dystrophy and corneal degeneration are diseases of the cornea in which a white, opaque mineral (either cholesterol or calcium) is deposited in the cornea (the clear front part of the eye). The size, shape, and density of the areas of mineral deposits vary. Although these affected areas can be highly visible, they rarely cause blindness. Corneal dystrophy may be an inherited trait in several breeds, including the Shetland Sheepdog, Siberian Husky, Beagle, American Cocker Spaniel, Miniature Schnauzer, and Airedale Terrier. 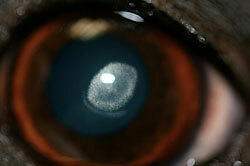 Corneal dystrophy affects both eyes and occurs in dogs of any age. It has been reported to occur in dogs with high levels of cholesterol or calcium in the blood. Routine blood work can be performed to evaluate for these possible changes. Corneal degeneration can affect one or both eyes, and may occur in areas of the cornea that have suffered a traumatic incident or chronic disease process. It is not an uncommon finding at the center of the cornea in our geriatric patients. Corneal dystrophy and corneal degeneration can lead to corneal ulcers (superﬁcial to deep), ocular infections, and corneal scarring and vascularization arising from continuous sloughing of the mineral deposits. Severe cases can cause visual impairment. Our goal in treating corneal dystrophy and corneal degeneration with topical medication is to improve the health of normal cells overlying the corneal minerals. We may also treat these diseases through dietary management (low-fat, high-ﬁber diets). Some patients may be candidates for treatment with a topical acid treatment (TCA), which helps to dissolve the mineral. This treatment may be performed once or multiple times and is often effective in improving comfort, reducing the mineral and preventing further ulcers.